If there's one thing Brandon Sanderson is a master of, it's world-building. If there's a second thing, it's genre-mashing. If there's a third, it's probably something obscure, like mini-golfing or cake decorating. Picking up a year after where The Alloy of Law left off, Shadows of Self continues fleshing out the wild west-styled world of Mistborn, centuries after the climax of the original trilogy. It's the same kind of 'swallow metal and gain superpowers' schtick, but alongside bowler hats, carriages and magic-aided revolvers. Kinda like that awesomely terrible Wild Wild West film with Will Smith, except the giant metal spider is replaced by people in evening wear who can fly and slow time. So, y'know, better. Nobleman and part-time law enforcer Waxillium Ladrian has a problem; namely, his uncle, who's secretly the head of an evil crime syndicate controlling the city of Elendel in the middle of a protracted period of civil unrest. While looking for leads that will hopefully bring about his uncle's downfall, Wax, his good (and still very crazy) friend Wayne, and the sharp-minded Marasi are drawn into the murder investigation of a corrupt city lord. When the killer turns out to be a creature not seen walking the world for centuries, Wax soon discovers that more than just Elendel may be at stake. I'm hesitant to get too into the plot here, as part of Sanderson's renown lies in his unexpected plot twists and intriguing narrative turns. Shadows is in the unique position of being both the start of its own trilogy (with Alloy of Law considered something of a prequel novel) and a continuation of the larger Mistborn story. Those who started off with The Final Empire and made it all the way here, like myself, will find a ton of little in-jokes that are nice little winks to the series' greater history. Conversely, those coming to Mistborn fresh with this book will find it largely accessible as a jumping off point; hell, you'll probably want to jump back after this one, read the preceding books, and find out why all those occasional comments about the Ascendant Warrior are so poignant. Speaking as someone who's very knowledgeable of Mistborn's series history, it's fascinating to see the world evolve from the high fantasy/slight post-apocalypse setting of the original stories, to the industrialised cowboy vibe of the sequel series. As Sanderson himself said, at length in a recent blog post, his intention with Mistborn is to show a world as it grows older, changes, forgets and remembers itself. It's a risky gamble, especially for a fantasy story where some novels involve over 700 pages of time spent with characters who become beloved, to almost entirely switch casts and locales between books, but it's a gamble that largely pays off for Sanderson. I actually found Shadows and Alloy to be more fun than the originals, which I adored the same way YouTube adores cat videos. The characters are all pretty vibrant and well-written, with special note this time round going to resident crazy person Wayne, whose arc gets quite a bit of narrative filling-in this time round. Wax has a tendency to angst on occasion - though given the circumstances of the plot, that later becomes quite understandable - while Marasi adapts to the slightly dry world of being a legal enforcer of Elendel alongside grumpy men who want her out of a job. There are also some fairly unexpected appearances of familiar faces, including one in particular I thought we'd never see in the history of the series again (for newbies, all returning players are explained as to who they are). Also on point is the prose, written with smooth and engaging authority, and the narrative, which is paced like a rather fast episode of CSI crossed with a slightly bloodier incarnation of a Clint Eastwood western. On that latter aspect, there's a tendency for some scenes to get a bit lost in the shuffle given how swiftly the plot beats feet; a particularly emotional scene in the middle with Wayne's backstory doesn't get given much follow-up afterwards, when it's clearly a fairly pivotal reveal for his character arc. I'd assume Sanderson's saving the meat of that story for the next two books, because there's a lot in Wayne's story - not to mention Wax's and Marasi's - that'll have repercussions further down the line. Shadows really concerns itself with laying the foundation for the following instalments of the trilogy, which is both great and slightly frustrating. Ultimately, Shadows of Self is another fantastic showcase of Sanderson's fantasy writing mastery. It'll either get you keen to read the previous volumes, or pumped for the following ones (with the next, The Bands of Mourning, due out in January 2016). You may also start eschewing any metal on your body; it might make you a target. 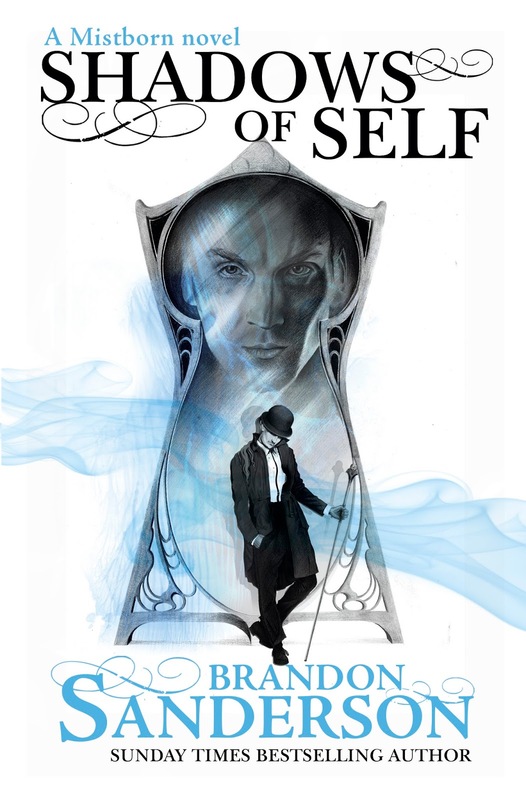 Shadows of Self is available in bookstores now. Review copy supplied to Geek of Oz by Hachette Australia. The Humor is one of the things that I’ve really enjoyed about series of Mistborn books. There are so many funny instances and dialogue that I laughed so many times throughout the story.